We only accept coupons for products we sell. Coupons must be presented at the time of the transaction, and item purchased must be identical to coupon criteria (size, quantity, brand, flavor etc.). Coupon amount may be reduced so that any combined discounts and coupons do not exceed the value of the item. The total transaction amount may not fall below zero or go negative.. i.e. we will not give the customer money back. Only 1 Manufacturer coupon may be used per purchased item. However, Manufacturer coupons may be combined for use with a Boyer's Store coupon. The combined savings may NOT exceed the price of the item. Multiple coupons for the same item, will be accepted UP TO A LIMIT OF 5 of the same item, and you must meet the purchase requirement for each coupon. Buy 1 Get 1 Free Items - A manufacturer coupon may be used for each of the 2 items (2 coupons), as long as each manufacturer coupon only requires the purchase of a single item. If the coupon requires the purchase of 2 items, it may be used on a Buy 1 Get 1 Free product. All coupons must have an expiration date, and must be used prior to expiration date. Coupons will not be accepted if they appear distorted or blurry, or are altered in any way or copied. Boyer's reserves the right to refuse any coupons at its discretion. "Checkout Coupons" (Catalina) - We will accept "Catalina Checkout Coupons" printed at our competitors registers fordollar/cents off of a specific product, provided the following criteria is met. Must have "Manufacturer Coupon" with specific item requirements printed on coupon, contain valid remit address for the manufacturer, valid expiration date and contain a scannable bar code. We will NOT accept Catalina Checkout Coupons from our competitors for Dollars/Cents off or % off and entire shopping basket order or departmental purchase. 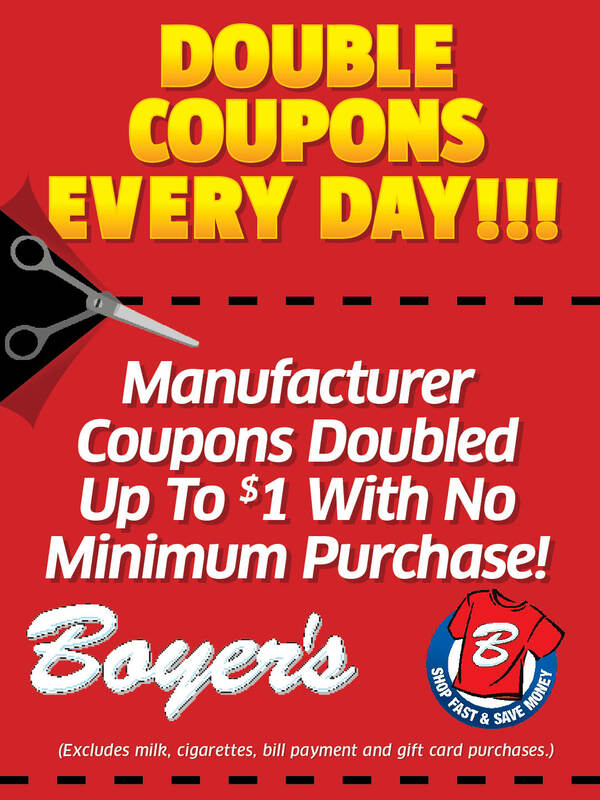 All Boyer's Food Markets locations Double Coupons Everyday. Coupons up to $.50 will be doubled at face value. Coupons over $0.50 will be credited at $1.00. Coupons over $1.00 will be credited at face value. This excludes coupons for cigarettes, tobacco, or coupons stating do not double! We accept Internet Printed Coupons. 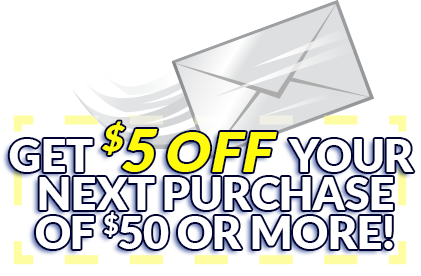 All Manufacturer and Store Coupon Rules apply to Internet Printed Coupons. Internet printed coupons must contain an industry standard scannable barcode. In some cases we understand home printing may reduce quality leaving this un-scannable.. These will still be accepted as long as scannable bar code exists on coupon. We will NOT accept Internet Printed coupons that require "no purchase" or for "FREE" product. Internet Printed Coupons may not be duplicated. SO YOU CAN SAVE MORE!